I chose the letter B to start in honor of my little guy Basel, my adorable long-haired dachshund puppy. Not to mention, its just an interesting letter. I was debating whether to do a B or to make a Z, which is my default letter of choice in honor of Zipper8Design. But I decided to go with the B because I liked the curves. Basically I used Photoshop to create a template with my letter in pale gray. You can easily do this in Word also, but I love Photoshop and simply felt more comfortable using it. I also found it helpful to be able to stretch the letter to make it taller and skinnier to better fit my frame. Then once I had the letter sized appropriately I printed it out, cut the paper to size for my shadow box (purchased at Michaels, though I have my eye on some square frames at Ikea) and started cutting up my crayons. I pretty much just cut and glued as I went, as opposed to laying out the full letter first like the original poster said to. But then again I’m a pretty spontaneous person when it comes to crafting, and worse come to worse I could pull a crayon off if I had to. (I did when the paper came unraveled on one small piece.) I also chose to use my glue gun, because I use it whenever possible, but Elmer’s or Sobo glue would have also worked just fine. The original poster had also broken her crayons into pieces, but I like clean straight lines and edges so I cut mine with my Olfa blade. I simply marked the place, and then sort of cut as I spun the crayon around, and when it got close enough to the center the whole thing would cleanly break apart. You can see the fun swirly pattern on the exposed crayon ends when you look closely, which I find kind of fun. I don’t know about anyone else, but I grew up watching Sesame Street religiously and they did a segment about crayon production that still, to this day, is so vividly in my memory it is a bit scary. (How do I know it is vividly in my memory? Because I’ve watched it on youtube more recently and realized exactly how much I remembered. And yes, I just watched it again right now and it really is awesome. 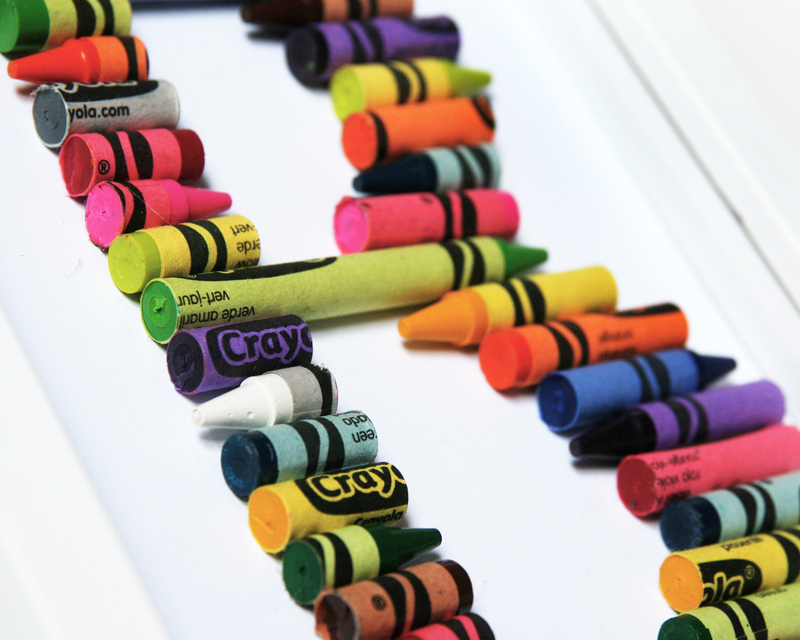 Is it me or do those crayons remind anyone of carrot sticks? And why do all the factory workers look like grandparents?!) 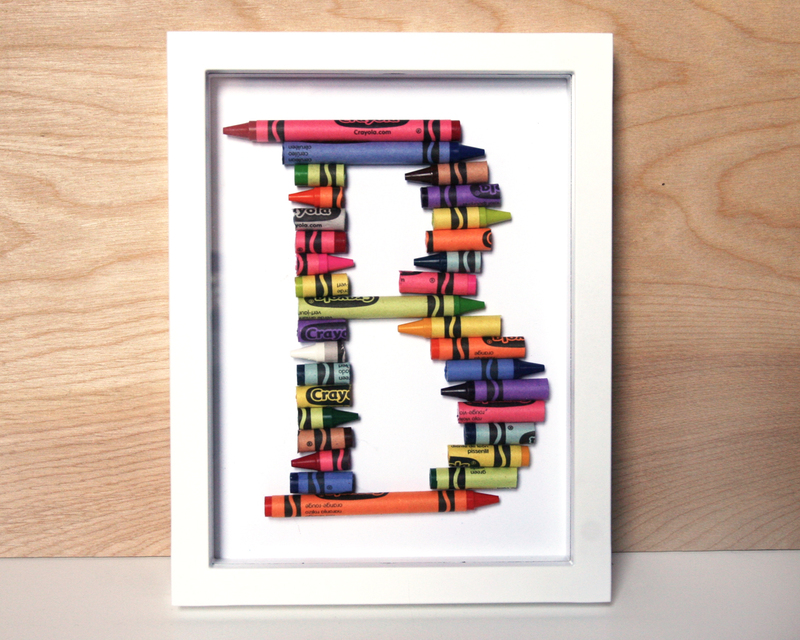 Anyway, that video was all I kept thinking about as I made my letter B, (which is another adorable segment, but that’s for another time…) There is just something so comforting and old school about a good Crayola crayon. 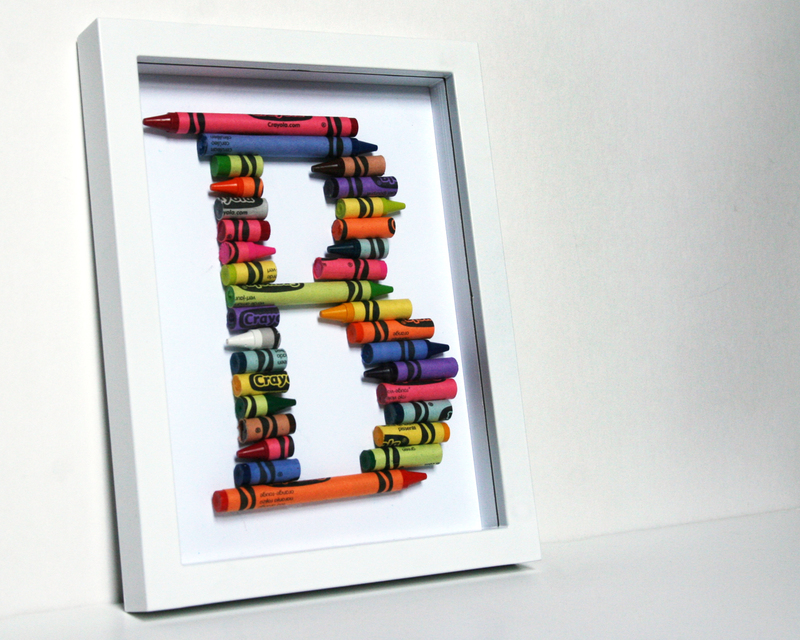 I think not only do these make cute teacher gifts as the original post suggests, but how adorable for a kids room?! 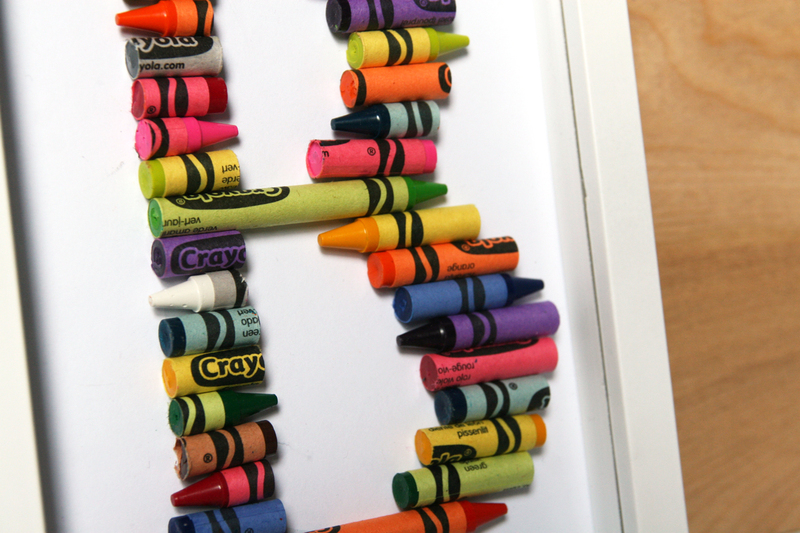 Or if you can find bigger longer shadow boxes you could do a whole monogram or a whole word! Ok, maybe a short word. But honestly, you can make anything you want out of crayons!! I’ve also seen this project done with colored pencils, but those are a lot harder to cut plus they don’t have the visual interest along the length of the pencil like the crayon wrapper. This could be fun with sharpened yellow pencils. For some reason the simple look of those pencils doesn’t really bother me as much, maybe because there is already the assumption that it will be a simpler look given that its all one color. I've already started pricing the cost of crayons and looking for less expensive shadow boxes, I've tried Walmart but came up empty handed on shadow boxes, but they may have just been out of stock! So check out the link and give it a try and let me know how it turns out for you! You should let her know you put her blog on your post so you can link up together. This would make a great baby shower present! And being the upcycler-to-the-bone-marrow that I am, I'd be combing thrift stores and yard sales for serviceable crayons and frames before I ever succumb to WalMart or even Dollar Tree. Sooooo cute! I love this idea! What a great project! I just love it. I will be making these for my nieces and nephews for sure.